Sea as far as the eye can see. On blue sunbeds we recline after another fabulous feed. The food on board has been exemplary with our Sri Lankan chef producing feasts to behold for breakfast, lunch and tea, including mas huni, a traditional Maldivian breakfast made famous in K’s blog (http://travelpilz.com/traditional-maldivian_breakfast/). 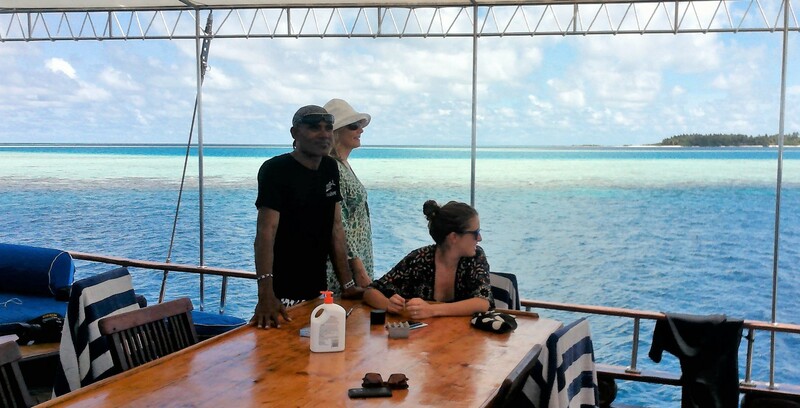 Our motley crew of expat workers and tourists, congratulate ourselves and the main organisers, on hiring, without a doubt, THE best live aboard vessel in The Maldives. 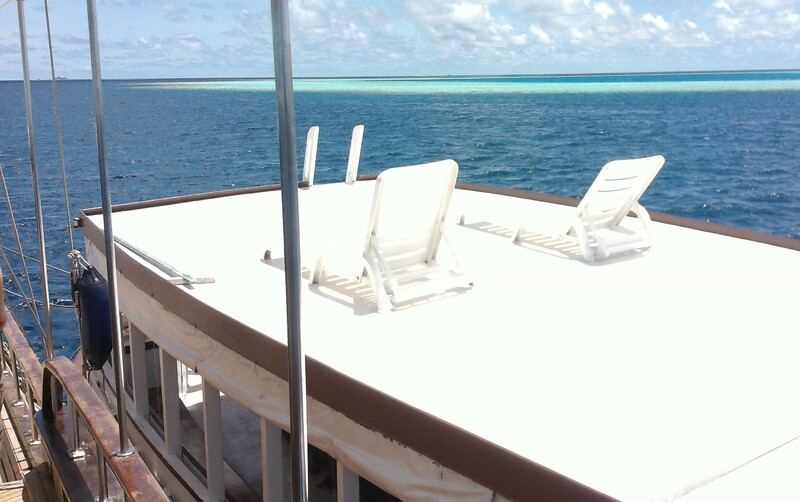 We are pleasure seekers cruising on The Felicity for 4 days among the atolls and sandbars of this stunning environment and this ship is all class, timber decks, air con cabins, hot water. This pleasure playground is a no brainer. Finally on board and not all is rainbows and moon beams. We board and then wait and wait. Waiting for …our trip dive master. Apparently he’s rummaging around for our dive gear somewhere despite all specifications being given days in advance. A night dive was also promised so torches need to be acquired. Mmm. My expat friends declare no surprise that ‘things’ are hardly going to plan and that ‘things’ rarely do in this corner of the world. 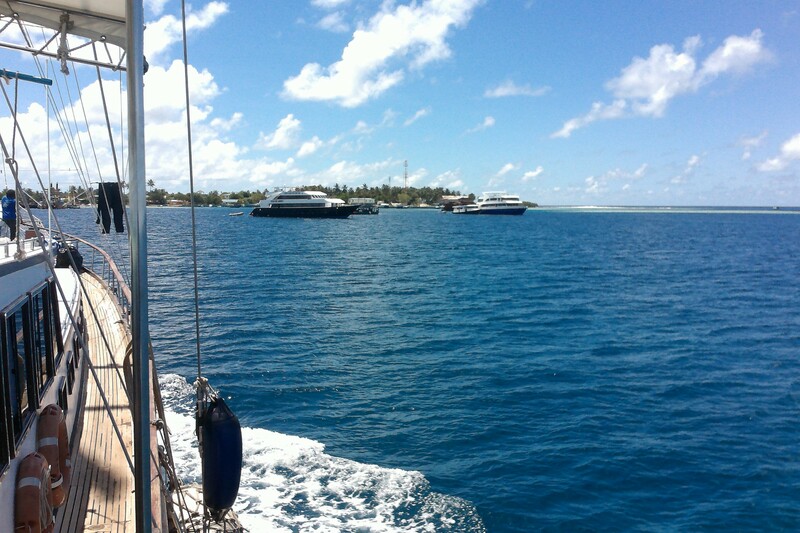 The hope had been we’d be far distant from the capital, Male, by now, but that doesn’t happen till the following day. Such resignation by the expat mob highlight their need for a holiday. Indeed they are looking forward to the r and r accompanied by a few beers on the boat. In an otherwise ‘dry’ country, boats and resorts are declared uninhabited and therefore alcohol can be served! Soon an easy companionship has taken hold on board. We are all feeling comfortable with each other and new friends discover common ground during casual chats. Books come out. Ben Elton, “Stark”, David Mitchell, “Cloud Atlas,” Asimov, “Second Foundation”….A certain comradery also develops with the local crew of our Turkish style vessel, our Felicity. 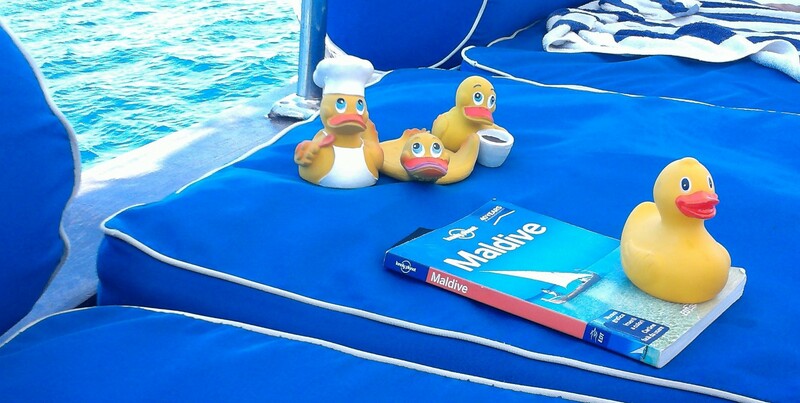 When Shafi, our AWOL dive master finally arrives we discover he lives on board. He is clearly comfortable in his surrounds and leans against a deck beam in his whale shark T shirt, bandana and dark sunnies, smoking a Camel Light. We later discover he’s a bit of a cowboy professionally. I don’t feel unsafe with him, but he could work on his communication skills. Later in the trip he takes a shine to K possibly as a result of her prolific posing of exotic yoga postures for the underwater camera during dives. This morning’s dive was easy and fun following some of yesterday’s ‘first dive day’ minor frustrations. Unhelpful teething problems with faulty and ill-fitting equipment, the wrong BCD, too many weights, tight, tight flippers which remain with me for the duration of the trip as no replacements are available, an ill-fitting mask. The latter is made worse once underwater by the manipulations of Shafi, who attempts to ‘fix’ its fit, leaving me temporarily blind as the ocean floods the essential waterless vacuum provided by the mask’s clear plastic barrier. For moments my eyes are open but sightless in saltwater. Despite everyone’s own initial individual struggles everyone descends. My ears pound refusing to equalize in haste, lots of swallowing and nose pinching required to coax the unblocking of unaccommodating tubes. 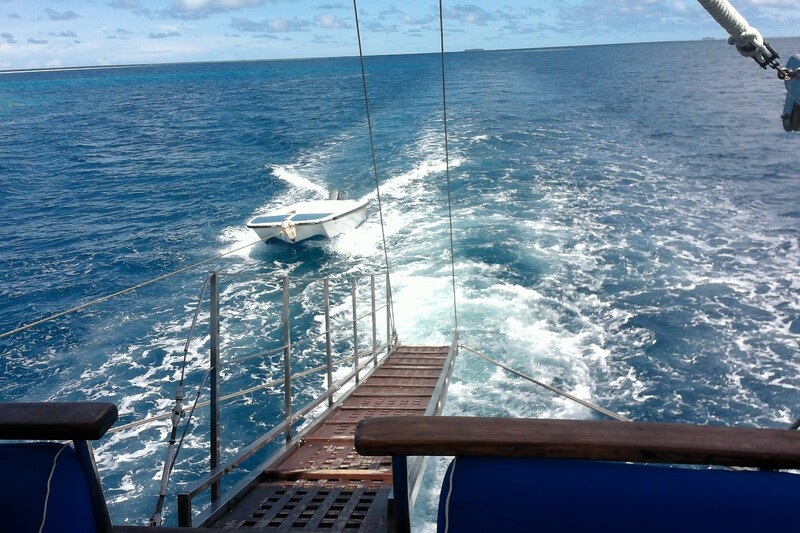 But Day 3 and these inconveniences are a distant memory , an easy descend, and life all around – turtles, reef sharks, rays, scorpion fish, moray eels, bright fish and coral and a frolicking frame of mind. And the day is glorious. Just like in the brochures. Today is to be the masterpiece. 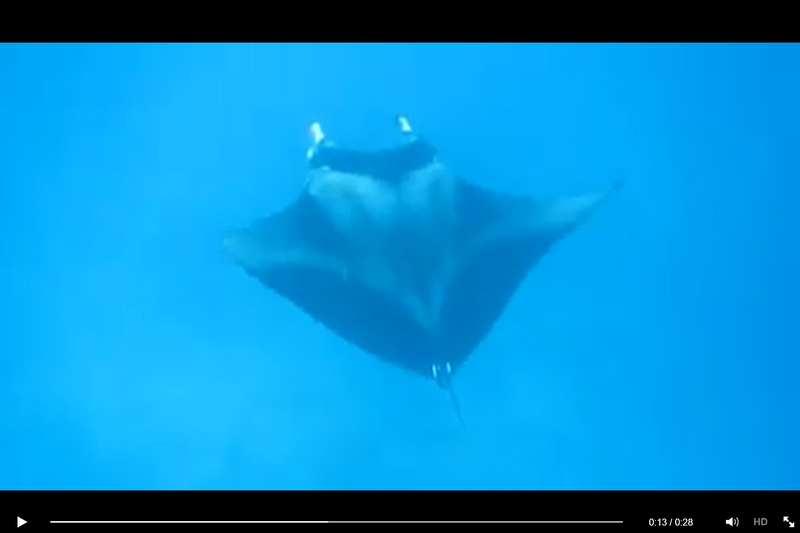 2 day and one night dive and in between ….mantas. Once spotted off the side of The Felicity three of us are over the side with masks and snorkels in a flash. It’s soon clear this is not going to facilitate effective viewing with these ethereal creatures quickly passing from view in the not so great water visibility. Luckily one of our trusty local crew has had the foresight to hop in the motorised dinghy and we all hang on for dear life catching a rock n roll tow, clutching a rope at the back of the little boat as we are dragged at speed in hasty pursuit. Some swimwear askew, modesty thrown to the wind, the sea life below catching an eyeful. And then we’re amongst them. I’ve had the great privilege of being in the presence of these great gliders before but you can never get enough. 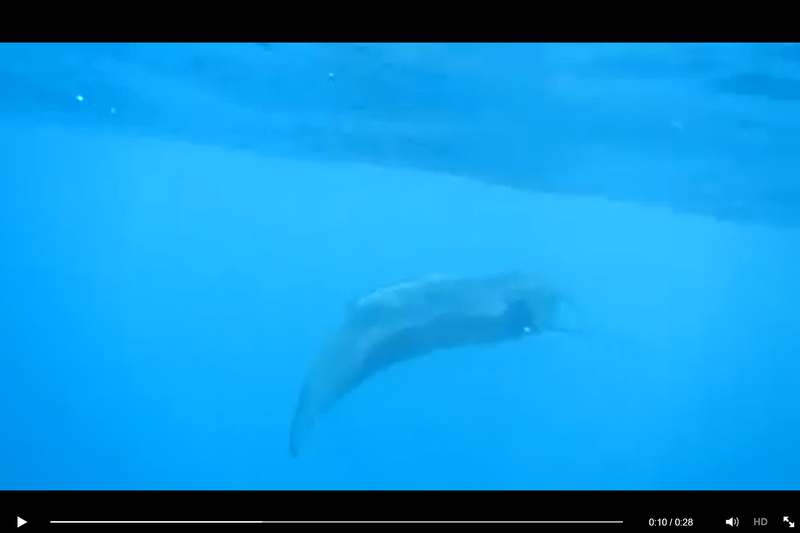 We see them, lose them, get towed some more, find them, madly swim out to them, lose them and so it goes. Laughter and excitement and reverence…. A great read, Lucy! It took me away from this pile of papers for a sublime moment of day dreaming. Thanks! Captivating Cape Town, sunning myself in South Africa.